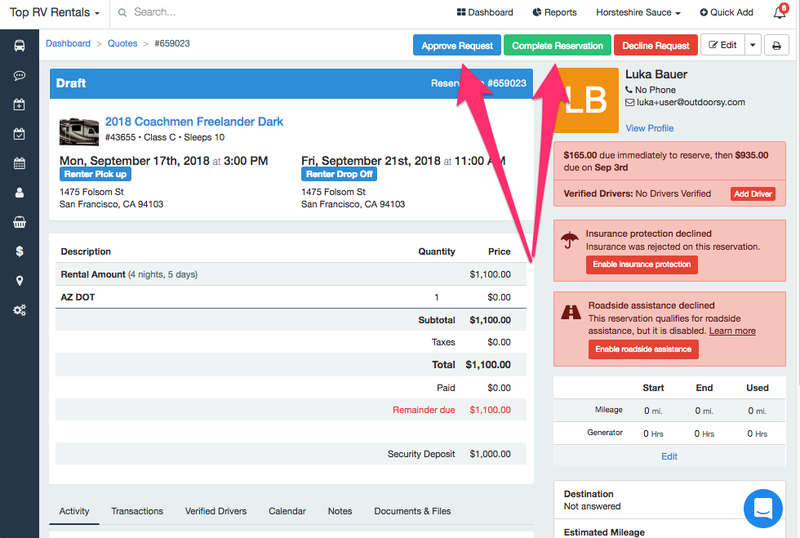 What's the Difference Between "Approve Request" and "Complete Reservation?" After you've created a Quote, and it is a "Draft", you have 2 options. Emails the renter an approved quote with the booking information and a button at the top that allows them to go through the online booking process and pay the reservation deposit to have a paid reservation and reserve the unit. This should be used for Outdoorsy Leads, as they should be the ones finalizing and submitting their payment. Pulls up the screen on your Wheelbase account in front of you to enter in the renter's card number to charge them for the reservation deposit, schedule future payments, schedule security deposit, finished with an emailed receipt with all the details. Basically one is to send them the email so they can finalize the booking, the other is so that you can do it yourself, presumably while you're talking to them on the phone to book their reservation.